The concept of an elevator pitch — a quick, on-the-spot business proposal designed for those times you find yourself in an elevator with a millionaire looking for a business or idea to invest in — got its annual ski area twist on Friday at Peak Pitch. 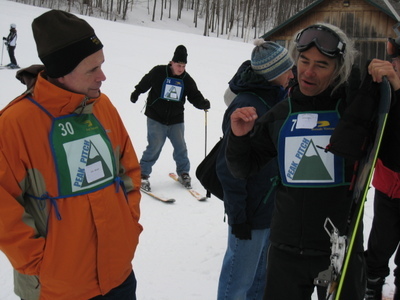 About 40 entreprenuers and 20 venture capitalists got together at Bolton Valley and turned the elevator pitch into the chairlift pitch. The event, sponsored by Fresh Tracks Capital, got skiing and snowboarding entrepreneurs the ears of investors for six precious minutes at a time on Bolton's lower valley quad lift. 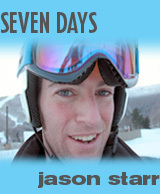 The fast-skiing entrepreneurs got about seven chairlift pitches in over three hours. Ideas ranged from bath products to sporting goods to renewable energy to medical diagnostics. The best pitchers were given little green $$$$$ cards that qualified them for a final pitch-off over lunch. It was an invaluable networking opportunity at the very least, and at most, a chance to plant the seeds for real investment agreements to negotiate at formal follow-ups. Kluster, Vermont’s user-based project development system (that’s a poor description — just go to the web site to really get the lowdown) won the pitch-off. A natural soap manufacturer (with visions of changing the natural beauty products industry) placed second, and a renewable energy software development company was third. Great event. The snowboarder in the photo came from Aspen to talk snowboarding and harnessing wind energy.